In many homes, the words "clutter" and "playroom" go hand in hand. Your playroom is often so cluttered that there's no room for actual playing. 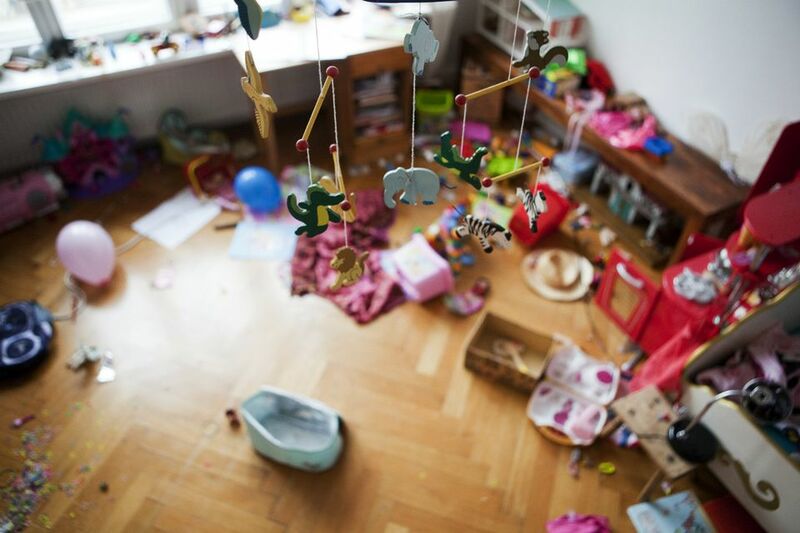 Your kids end up taking games and toys to other rooms to use them, spreading the clutter as they go. You can't enter in your bare feet for fear of stray (and sharp) matchbox cars, Legos or doll accessories. The last time you pulled Chutes and Ladders off the shelf, five other games came crashing down on your head! If you frequently find yourself comforting a tearful child who has just discovered yet another favorite toy has been crushed in the clutter of the playroom, there's hope. It's going to take a time commitment that you now feel compelled to keep because seeing your kids cry is hard to watch. It's also going to take energy, persistence, and creativity. At this point, your kids are in awe of how many toys they have. Then they'll feel the rush to play with their toys, ruining all the work you did. So, this would be a good time to take a snack break and get them away from the playroom. Now that you have a clear picture of everything in your playroom, reduce it by half. Label bins with each category above. Review all of the items in each category and select at least half of them to be put in storage. Place those items in the appropriate bins and store the bins elsewhere, like the garage, basement, or closet. Now you can periodically rotate these stored items with those you've left in the playroom. You know those rainy Saturday mornings when you have no plans and your kids are driving you crazy? That is the opportune time to bring some toys out of storage. If you add something to the playroom, you must put something else back in storage. Limit the make-believe centers to two or three. If you have additional items, put them in storage as well and rotate them periodically. While you're purging, keep an eye out for toys that your child has outgrown or no longer uses. Consider donating these items and remove them completely from both your playroom and your home. Evaluate the layout of your playroom and divide it into three or four zones, such as the book, game and puzzle zone; doll zone; the planes, trains and automobile zone; and maybe the arts-and-crafts zone. Each zone should have some type of shelving unit to store the toys remaining in the playroom. You can find inexpensive plastic or wooden shelves at Target, Walmart or even your local Dollar Store. While there, look for bins or baskets that fit on the shelves. Cut out pictures of each toy or item that is staying in the playroom, and tape them to the front of the appropriate bin or basket. Every item in the playroom should be in a specific spot in one of the zones. The pictures will help children who can't read yet identify where items belong. Now, your children can help keep the playroom neat, organized, and free of clutter. The key to eliminating clutter in the playroom is to stay on top of it on a daily basis. Make cleaning up the playroom a game. This can also go for cleaning any room in your house. At the end of each day, set a timer for five minutes. Help your children put everything they've been playing with back in the appropriate place. As they get older, have them do it themselves while you supervise. Once your children no longer need a playroom, the habits you've helped them establish will carry over to their bedrooms and ultimately to their homes. Can you commit to 15 minutes a day of decluttering? Not sure when to get rid of something? Here are 7 questions to help you make the decision to toss or keep.